Zimmer Group has been a world leader in end-of-arm tooling and automation components since 1980. Our product range is far reaching and extensive. We offer over 4,000 standard off the shelf grippers, rotary actuators and robotic accessories such as tool changers and compensation units. As well as gripper technology, we also manufacture shock absorbers and linear rail clamps and brakes. 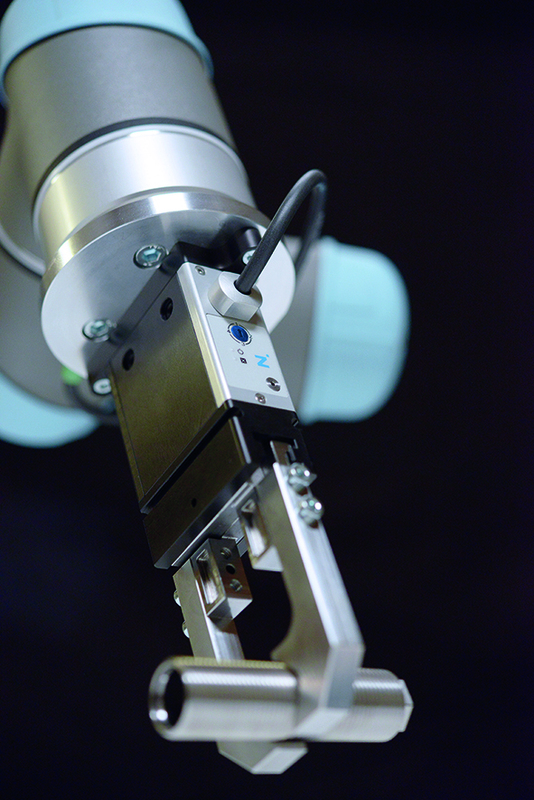 Also known as “The-Know-How-Factory”, Zimmer Group was the first manufacturer to produce a fully safety rated collaborative gripper. Besides our standard products, we are globally recognized as a specialist provider of customized end of arm tooling. With IMTS being such a large show, it is a great opportunity to showcase products to a truly knowledgeable audience. Often the attendees have specific applications in mind and it is great to discuss so many applications face to face. Also, attendees are looking for ideas and product to use and we have some unique, technology leading offerings for the market. We have a full line up of over 60 models of IO-Link grippers which are ready for the smart factory and Industry 4.0. This includes 4 types of true collaborative grippers which are already on the market today and not just a concept. We also are showcasing our new GEP2000 series electric grippers – IMTS is the official launch of these small, long-stroke electric grippers which have the highest power to weight ratio of any small electric gripper available today. On our booth, we have live demos of our clamps and brakes for linear rail and our shock absorbers. This year it is a very interactive booth compared to previous IMTS shows which we hope will be very educational for visitors. We always look forward to seeing what trends are happening on the manufacturing scene. This year it will be interesting to see what augmented reality solutions are being offered and what new gripper solutions are emerging for the logistics industry. And as always it is fun to see the inventive displays from all the robot manufacturers. Overall, networking with both our peers in the industry and finding new people with new ideas is important for us. Additionally, as one of the key technology leaders for grippers, especially smart grippers – a high priority for us at IMTS is to discuss these products with the market, understand the manufacturing processes and to show the additional possibilities that these products can bring to their processes. Tradeshow weeks are busy so generally no one gets time for sightseeing. Chicago however is full of great restaurants where you can unwind over delicious food. Gyu-kaku Japanese BBQ is a fun option, for sushi try Union Sushi, and you’ve all got to experience Giordano's for Chicago deep pan pizza – go with an empty stomach!